Please see the list of links and resources below, which was compiled by our very own NAWIC members. There is vast amounts of information on the internet, but we hope that you will find this list very helpful and useful for all women in construction. The Connection is designed to keep you informed with pertinent Association news. Read up on timely announcements and messages from the NAWIC Board, and learn about the outstanding activities our regions, chapters and members are involved in! Safety Article - What is that Smell? The NAWIC Education Foundation (NEF) was established in 1973 by the National Association of Women in Construction (NAWIC). NEF has focused on construction education and offers a number of construction related adult education programs. See examples of current classes offered below. The NAWIC Education Foundation has developed several programs and competitions created to foster and promote construction as a viable career choice among students from grade school to high school level. The Granite State Chapter #218 either holds events with the following organizations or one of our members participates in the organizations below. 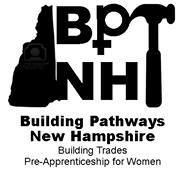 We feel as these affiliations benefit our careers as New Hampshire Women in Construction and we encourage you to view their websites or contact us for more information if you need a contact at one of these groups.